San Marcos, California—May 3, 2016—Dr. 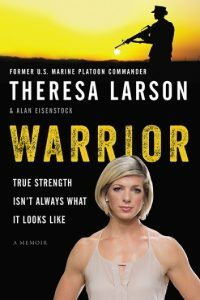 Theresa Larson, a 2012 Doctor of Physical Therapy graduate from the University of St. Augustine for Health Sciences (USAHS), a leading graduate institution that emphasizes rehabilitative and health science education through innovative classroom education, is the author of the newly published Warrior (HarperOne, 2016), a memoir that chronicles her journey to wellness and her internal fight with body image issues at home and on the battlefield. Health, wellness and caring for others have been central themes throughout Dr. Larson’s life. At the age of 10, she was a caregiver to her mother, who died from cancer. After playing softball in college, she led a semi-professional career in Italy. In 2003, she was commissioned as a second Lieutenant in the U.S. Marine Corps, following in the path of her father and brother, who also served in the U.S. Armed Forces. She went on to become a high-achieving lieutenant who led a platoon in Iraq. During her tour, halfway around the world, she faced her most difficult challenges to date: serious body image issues and bulimia nervosa, which ultimately cut short her military service when she was voluntarily evacuated from combat. Warrior details her path to health and wellness. The memoir is ultimately a success story, written with the hope and desire to help other people battling their own health issues. “I hope the book shows people that they are not alone. What is truly on the other side of fear is courage. You must face your fears and shame to grow. Warrior will show you that growth is possible,” shared Dr. Larson. Today, Dr. Larson is the founder and president of Movement Rx, a physical therapy and human performance company that offers training and support to wounded warriors and individuals with health and movement issues in southern California. She also supports the nonprofits Team Red, White, and Blue; Linder Kids; and the Resiliency Project. To schedule an interview with a Dr. Larson or for more information, please contact Rachael Lighty at [email protected] or 410.218.6055. The University of St. Augustine for Health Sciences (USAHS) is a graduate institution that emphasizes health science education through innovative quality classroom and distance education. Founded in 1979, USAHS has locations in San Marcos, California; St. Augustine, Florida; Austin, Texas and Miami, Florida. USAHS offers degree programs in physical therapy, occupational therapy, education and health science, as well as continuing education programs. For more information, visit www.usa.edu. USAHS is a member of Laureate International Universities, a network of more than 80 institutions in 28 countries and one of the most significant global higher education providers for health sciences. For more information, visit www.laureate.net.